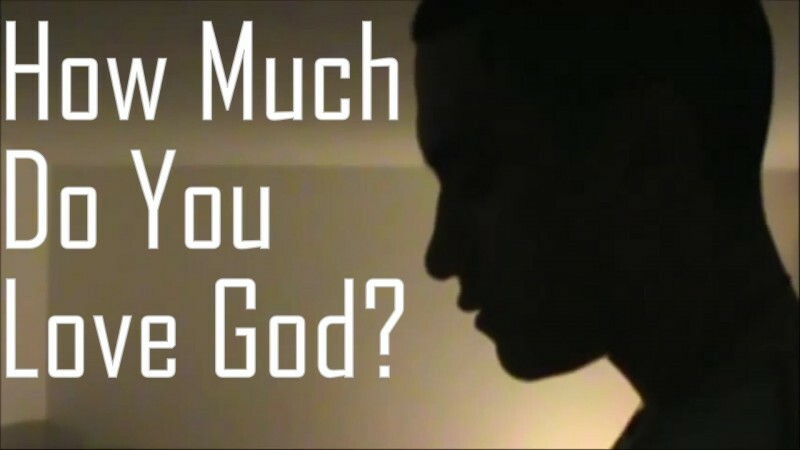 First Christian Church - SERMONS - How Much Do You Love God? Everything in Christian life is related to these two commandments. All the sermons, Bible studies, and Sunday school lessons, are explanations of some facet of loving God or loving our neighbor. Since every other law hangs on these two commandments, how well are you keeping them? Do you love Jesus with all your heart or do other things and people get first place in your life? Do you love Jesus with all your soul, which is, with all your emotions and personality, or are there other things that you are more interested in and more excited about? Do you love Jesus with all your mind, or do you concentrate on your career or meditate on how to fulfill the desires of your flesh. Some people believe they are fulfilling these commandments by saying, “I’ve gone to church all my life.” Going to church is good, but knowing about Jesus is not the same as loving Him. Going to church does not mean you are a Christian, which means Christ-like. Christianity is not a religion, going to services, or keeping a set of rules, but a relationship, an intimate love relationship with the Father, Son, and Holy Spirit. We try to substitute knowledge and rules for intimacy because they are so much easier. It’s easy for us to say, “Well, I believe in Jesus and I try to live right,” but Jesus wants to know us intimately. Jesus wants us to know Him intimately, as in a marriage. As all married people know, it takes a daily effort to maintain an intimate relationship. Jesus is our Bridegroom and the Church is His Bride. Have you entered into a marriage relationship with Jesus, or are you practicing a religion and still flirting with the world? We often busy ourselves, “doing things for the Lord or the church”, but are those things Jesus wants us to do? Do we listen for His instructions or just do what we think is right? After all, how can we do His will if we don’t know Him and love Him and hear His voice? Turning it around, how can we say we know and love Christ if we are not obeying Him? When considering someone to marry, it is good advice to marry someone who is your best friend. What is the sign of a friend? That he tells you secret sorrows? No! Many will confide to you their secret sorrows in search for sympathy. But a mark of intimacy is to confide secret joys, knowing the joy will be shared equally without envy or ridicule. At the beginning of our Christian life, we are full of requests to God. Then we find that God wants to get us into a relationship with Himself, to get us in touch with His purposes, His heart. Have you ever let God tell you any of His thoughts, or are you telling God your sorrows and secrets so continually that you leave no room for Him to talk to you? If so, you are missing intimacy with God and forming a religion instead of a “marriage”. John 15:13-15 Greater love has no one than this, that he lay down his life for his friends. You are my friends if you do what I command. I no longer call you servants, because a servant does not know his master's business. Instead, I have called you friends, for everything that I learned from my Father I have made known to you. True friendship is rare on earth. It means identity in thought and heart and spirit. The purpose of discipleship is to train us and conform us to the image of Jesus Christ until we have His thoughts, His heart, and His Spirit. If we are Jesus’ friend and we love Him, then we know His ways and we walk in them. 1 John 2:3-6 We know that we have come to know him if we obey his commands. The man who says, "I know him," but does not do what he commands is a liar, and the truth is not in him. But if anyone obeys his word, God's love is truly made complete in him. This is how we know we are in him: Whoever claims to live in him must walk as Jesus did. Being a friend or a disciple of Jesus Christ means personal, passionate, devotion to a Person. There is a difference between devotion to a Person and devotion to principles or to a cause. Our Lord never proclaimed a cause; He proclaimed personal devotion to Himself. Many of us who call ourselves Christians are not devoted to Jesus Christ. No man on earth has this passionate love for the Lord Jesus unless the Holy Spirit has imparted it to him. We may admire Jesus, we may respect Him, and reverence Him, but we cannot love Him, unless the Holy Spirit puts the very love of God in our hearts so we can love Jesus. The Holy Spirit will take our heart, our nerves, our mind, our whole personality, and simply make us blaze and glow with devotion to Jesus Christ. Our love for Jesus must surpass any love we have for anyone else, including self, spouse, parents, and children. If the closest relationships of life clash with the claims of Jesus Christ, He says it must be instant obedience to Himself. Otherwise, how can we say, we love Him with all our heart, soul, mind, and strength? The Creator of Heaven and Earth has offered an invitation to you and me. He said, in effect, “I want you to know me more closely and intimately than you know anyone else. I want to be in you and I want you to be in me. I want you to know my heart. I want our souls (our mind and personality) to come together, for both of us to know the other deeply and wholly.” To those who are not intimate with God, this invitation strikes fear in their hearts and they remain aloof with Jesus. Because we fear this intimacy, many of us treat Jesus like a relative instead of a husband. We don’t talk to Him any more often than we talk some of our kinfolk, whom we telephone once in a while. We call Jesus on holidays, especially Christmas and Easter. We call on Him when we are in trouble and need something. How can we say we love Jesus intimately, when we don’t talk to Him every day? How would you like it if your spouse didn’t talk to you every day? Would that show much intimacy or love to you? Jesus doesn’t want occasional conversations with us, He wants daily pillow talk, like a husband and wife share. He wants intimate discussions of love and devotion. Then He wants us to arise and live for Him, communicating with Him all day long. The Holy Spirit is preparing us as a bride for Christ’s return. What kind of bride do you think the Holy Spirit will present to Jesus Christ on that day He returns? One who is half-hearted? Whose love is lukewarm, or cold? Who is not devoted to Jesus? Who does not want intimacy with Christ? NO! That kind of bride will be rejected, spewed out of His mouth. The Holy Spirit’s mission is not complete until He creates in us a passionate, ever-increasing desire for Jesus! If we truly love Jesus, He’s never out of our mind. We want to be in His Presence. We want to obey Him. We long to be with Him with a yearning, a groaning in our spirit. Therefore, we prepare ourselves for His return like a bride prepares for her wedding. This is the deep, inner cry of someone who hungers for holiness and is anguished over his sin. His heart’s cry is, “Holy Spirit, You know the mind of God. You know how to pray according to the will of the Father. Walk with me - take control of my life. Empty me of all selfishness and fill me with Yourself. Prepare me to meet Jesus!" What has happened in your life since you got saved? Are you just going through the motions? Are you lukewarm? Are you afraid to get "on fire" for the Lord because you’ll be considered a fanatic? Can you say right now you’re ready to go be with Jesus, that you want Him more than your very life? Are you more passionately in love with Jesus than when you first met Him? Peter had completely blown it with Jesus. He denied Jesus three times after pronouncing his love and willingness to die for Jesus. Jesus predicted Peter would do exactly what he did. Like Peter, Jesus knows us better than we know ourselves. So when we are asked the question, “How much do you love God?” God knows the answer, but He asks the question to make us cognizant of our love for Him. The New Testament was recorded in the Greek language, which has several words for love. Agape: the love God has for man. Eros: sexual love. Philia: love for friends. Storge: parental love. So when Jesus asked him, “Do you truly agape me,” Peter understood Him to mean, do you truly love me like I love you, with God’s love? Apart from the Holy Spirit, none of us can love like God loves. From the experience of his denial, Peter learned not to think more highly of himself than he ought. So this time Peter answered realistically, “I philia you”, which means “I love you like a friend.” Since Peter had denied Jesus three times, he was given three opportunities to express his love for Jesus. Jesus knew the Holy Spirit would soon give Peter God’s love. Therefore, He told Peter each time to “feed my lambs”. In other words, if you love me, follow me and do what I would do. Share the Gospel with those who are young in faith. That is how we come to know and love Jesus—by being filled with His Spirit and doing what He would do for others—love them and care for them. Jesus said when we show love toward others, we are showing it to Him. Right now, the Holy Spirit is poking at the embers of our love with the question “how much do you love God”. He desires to set our hearts on fire for Jesus Christ. Is He showing you how you can love Jesus more? Are you allowing the Spirit to convict you of sin and unbelief? If you are experiencing this work of the Holy Spirit, rejoice! He wants you to be in love with Jesus and cleansed from every spot or wrinkle on that day when you meet your Bridegroom! So yield to the Holy Spirit. Let Him do His work in you completely - and you truly will know what it means to walk in the Spirit and to truly love your Bridegroom, Jesus Christ. You can begin experiencing intimacy with Jesus and living His eternal life today. Jesus prayed this—that we may know God—not that we would be wealthy—not that we would be healthy, but that we would know Him. Do you want to know Jesus and have the intimate relationship He wants to have with you? If so, ask the Holy Spirit to give you such a revelation of Christ that you’ll be totally weaned from this world and totally in love with Jesus. If you don’t have a relationship with Jesus because you have never given your life to Him, you can become a disciple of Jesus and begin an intimate relationship with Him now. Believe Jesus is the Son of God who died on the cross to pay for your sin. Repent of that sin and give your life to Him by dying to self in a water baptism. You will be born again of the Holy Spirit. He will begin washing you with the water of His Word, showing you what is in your heart so you can continue to repent, and giving you the mind of Christ. Each day will be an opportunity to draw closer to Jesus and to know Him and love Him more.